Stock headlights for motorcycles work fine, but LED types work better when it comes to staying visible on the road and giving your bike a boost of style. With LED halo rings around a basic headlamp, that style goes from zero to 60 fast. 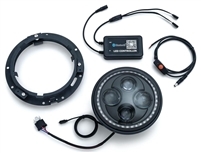 LED halo ring headlights are simple to install and provide added interest to your bike both day and night. Radiantz has offered the best LED technology since 1999. Turn your touring bike or Sportster into a showpiece with LED halo rings for headlights in a variety of sizes and colors. Angel Eyes headlights come in cool green while Demon Eyes shine blood red. We also offer blue, orange and even color changing halo headlights for a truly unique look. Install easily with a low-high LED headlight adapter kit, or go high-tech with a halo setup controlled by Bluetooth.